The new Ford C-MAX Diesel Estate is an MPV that can seat five people. It drives well, boasts low running costs and offers a fair amount of practicality. Buyers can choose between a short and a longer wheelbase model (the C-MAX Grand) but for the purpose of this review, we’re covering just the shorter model. The major difference between the two? This standard model can’t be specified with seven seats. Other than that, it’s essentially the same size as a Ford Focus – but more usable. Read our summary of the long history of Ford here. 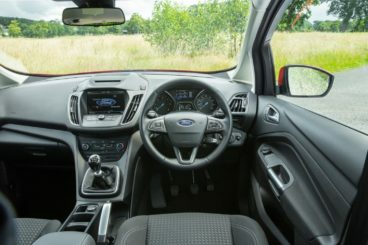 OSV takes a closer look at what it’s all about with our 2018 Ford C-MAX Diesel Estate review. The fact that it’s the same size as the Ford Focus – as well as the fact that it’s also based on the Ford Focus – means that the C-MAX is great to drive. It’s technically classed as a people carrier but it handles much more like an Estate. The steering is responsive and accurate, and while the car does lean a bit more in corners than the Focus, this isn’t a huge problem at all. That said, the reason that body lean is kept in check so well is down to the firm suspension, which some buyers might not like. All engines are fun to drive, although, for the most fun possible, you’d need to take a look at the EcoBoost petrols. The diesels, however, are quiet and smooth, and cheaper to run. They also have more pulling power to call on and make for great motorway cruisers. They also make much more sense for a workhorse car like this. A 1.5-litre 118bhp diesel is the highlight of the range with its 0-62 time of 11.3 seconds. It’s economical too and can return 69mpg on a good day (according to official numbers anyway). A 2.0-litre diesel is a better bet if you want as much power and pace as possible. It covers the 0-62 sprint in 9.5 seconds, develops 148bhp and can return almost 60mpg. That’s not too bad at all and buyers will appreciate its extra strength. It pulls away fast from low revs and doesn’t make much noise. That said, this is also the most expensive diesel engine and you’ll need to think carefully about what your priorities are. Both diesels can be specified with the brand’s PowerShift automatic gearbox. One of the problems that seem to beset all MAX models from Ford is a cluttered dashboard. The one in the C-MAX is stylish – if a bit dated – and looks good, but it’s ultimately let down by too many buttons. As well as being confusing, some of the controls are a tad too fiddly for our liking. The supportive seats are nice and firm, and an elevated driving position affords you an excellent view of the road ahead. Overall, the cabin is well put together, comfy and pleasant to look at – but it’s the niggling issues that might deter buyers. A lot of this comes down to the buttons. For example, the heater controls are fairly simple enough, but there are other buttons which are just too small. All models come with a display screen, with the entry-level model getting a 4.2” screen and higher spec models getting a larger one. Is the Ford C-MAX Diesel Estate practical? Its boot is nicely shaped, its rear seats are versatile and its high roofline means that headroom is very good. There are one or two caveats: When all three rear seats are taken, space back there is a tad cramped. Overall, though, head and legroom are both good. Storage spaces include a reasonably sized glovebox, a few door bins and one or two open storage bins. The boot, meanwhile, measures 432-litres. Fold the rear seats and you can extend that to 1,684-litres. Is a Ford reliable? Read our honest assessment here. Standard kit across the range is good, with the entry-level model coming with removable rear seats, fog lights, body coloured door mirrors, 16” alloys, a heated windscreen, a digital radio and air conditioning. The Titanium model adds a bigger 8” display, a better stereo, all-round electric windows, rain-sensing wipers, cruise control and dual-zone air conditioning. The Titanium X model rounds things off with heated front seats, leather upholstery, bi-xenon headlights and a panoramic sunroof. It’s noticeable that sat-nav is optional for all trim levels. In terms of how safe the car is, the old C-MAX was awarded all five stars by Euro NCAP for its crash test performance, but this new model scored only 3/5. That will be a major disappointment to Ford, and it fared especially for child occupant protection and safety assist (29%). All models come with six airbags, emergency braking assistance, electronic stability control, traction control and anti-lock brakes as standard. Prices for the new car start out from £28,130. For more information on our leasing deals, you can check out our page here. In terms of its running costs, the 1.5-litre diesel that produces 105bhp is the most frugal in the range. It can return as much as 74.3mpg economy and emits less than 100g/km of CO2. That said, the 118bhp variant of the same engine is stronger. It returns a respectable 68.9mpg at best and emits 105g/km, which gives it a BiK rating of 23%. A 2.0-litre 148bhp diesel engine tops the range and it can return 64.2mpg if you stick to the manual gearbox. Specify the automatic and that number drops to 58.9mpg while its BiK rating jumps from 24% to 26%. 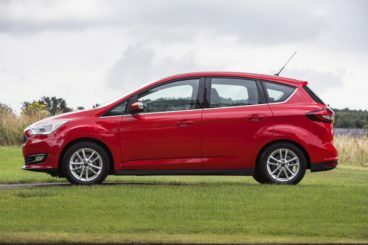 Provided you overlook the 2.0-litre automatic diesel, the C-MAX is a very affordable car to run. It’s based on the Ford Fiesta and it’s one of the most fun cars to drive in this sector. The C-MAX is a really usable car that comes with a large boot and a smart rear bench that you can split 40/20/40. It’s fine when just two adults are sat back there, but once a third gets in, things become very cramped. It’s not as modern-looking as rivals. Let’s see how the car fares against its rivals in the comparison section of our 2018 Ford C-MAX Diesel Estate review. 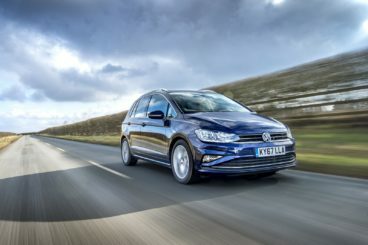 The new Volkswagen Golf SV boasts a massive boot, a roomy interior, and – as ever with a VW product – it’s very well built. On the road, this SV variant drives a lot like the Golf Estate. It’s taller so it leans more in bends, and its steering isn’t as sharp, but on the whole, there’s not much to separate the two and this SV model is almost as much fun. It handles responsively and holds the road well. In terms of its diesel engines, a 1.6-litre TDI unit sits at the bottom of the range with its output of 113bhp. It covers the 0-62 dash in 11.0 seconds but does feel a bit breathless when ascending steeper inclines. We like the 2.0-litre 148bhp diesel better. It’s more expensive but feels fast with its 0-62 time of 9.2 seconds. It also copes well with the car on a full load and blends performance with economy to good effect. Those running costs? The 1.6-litre diesel is the cheapest to run overall. It can return as much as 67.3mpg on a good day and emits just 110g/km of CO2. This gives it a respectable BiK rating of 22%, but you can knock that down to 21% by specifying the automatic gearbox. Doing so also knocks its economy down to 68.9mpg and its CO2 emissions to 106g/km. The 2.0-litre hardly costs much more to run, though. It returns 65.5mpg at best and has a BiK rating of 22%. Inside, a well-built cabin is the order of the day. And while a workhorse like the Golf SV is never going to be the most stylish car around, its interior design is better than most of its rivals. Its dashboard is a lot like the one in the standard Golf but less driver focused. It’s nice to look at, well constructed and user-friendly. It also looks like it’s built to last. Is the Volkswagen Golf SV practical? This is really where this car’s strengths ultimately lie. It houses more space than the Golf Estate, and it’s more versatile, too thanks to being taller and wider. It’s easy to get in and out of the car, and once inside rear seated passengers will find that they have a good amount of room to get comfortable. That said, the Golf SV isn’t as practical as an out-and-out MPV and feels a lot like a bigger Golf. That it is, but it misses out on flexible rear seating systems that rivals have, and interior space is its only party trick. Its boot, meanwhile, measures 590-litres when you slide the rear seats forward and 1,512 when you fold them flat. The new Citroen C4 Picasso is one of the most perfect family cars around. It’s affordable, looks good and offers plenty of space. It’s not as much fun to drive as the C-MAX, but entrainment isn’t high on everyone’s list in this sector anyway. Moreover, it’s comfortable and its steering is nice and positive. On the other hand, body lean is a bit of an issue when you take on bends, the manual gearbox is a bit hit and miss, and the steering lacks feel. In terms of its engines, a BlueHDI 100 that sits at the bottom of the diesel range produces 99bhp and records a 0-62 time of 12.8 seconds. It’s breathless on a full load and hard to recommend. A better option is the BlueHDI 120 diesel that develops 118bhp, and which has a 0-62 time of 11.3 seconds. It just feels more powerful and its extra punch will prove hand when the car is full. Rounding off the range is a speedy BlueHDI 150 diesel that can get you from a standstill to 62mph in 9.9 seconds. This is a 2.0-litre engine that’s obviously fast – and it’s pretty economical too, with its returns of 65.6mpg. There’s not much to dislike about it but a high BiK rating of 28% might put some buyers off. Meanwhile, both the 99 and 118bhp diesels can return a very impressive 74.3mpg. They each have a BiK rating of 25% which seems pricey for a car of this type. Inside, the C4 is quiet and comfortable but it can’t rival the Ford for quality. There’s not much wrong with its cabin on the whole, though, and it should be able to stand up to what you and your family throw at it. A panoramic windscreen ensures the interior feels nice and bright, insulation is good but a digital instrument console that’s centrally mounted won’t appeal to all tastes. It’s functional enough but the monochrome display that comes with the entry-level model is a bit bland. 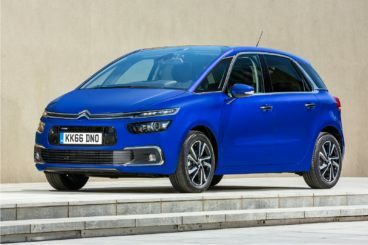 Is the Citroen C4 Picasso practical? It’s super easy to use, visibility is good and legroom is excellent for all. A small glovebox is a bit of a niggling issue but the C4 more than makes up for it with lots of other handy storage spaces. The boot, meanwhile, measures 536-litres and can be extended to 1,851 when you fold down the rear seats. The new C-MAX is a five-seater Estate that’s a family-friendly, a little bit sporty, and which boasts an enhanced interior richer in quality than last time. There’s a lot of hype around it, and its predecessor won the MPV category at the 2011 Parker Cost of Motoring awards. In 2018, the hype is still justified, and the Ford C-MAX Diesel Estate is a well built, comfortable and engaging car to drive.